by Bovee, Courtland L.; Thill, John V.
NOTE: This edition features the same content as the traditional text in a convenient, three-hole-punched, loose-leaf version. Student Value Editions also offer a great value; this format costs significantly less than a new textbook. Before purchasing, check with your instructor or review your course syllabus to ensure that you select the correct ISBN. Several versions of MyLab™ and Mastering™ platforms exist for each title, including customized versions for individual schools, and registrations are not transferable. In addition, you may need a Course ID, provided by your instructor, to register for and use MyLab and Mastering platforms. For courses in Business Communication. 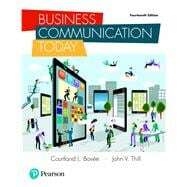 This package includes MyLab Business Communication . Business Communication Today continually demonstrates the inherent connection between recent technological developments and modern business practices. Each new edition addresses the most essential changes in technology and how they impact the business world, while still covering timeless business skills such as listening, presenting, and writing. With a strong focus on mobile integration, the 14th Edition blends current topics, such as social media in business, with more traditional entrepreneurial concepts. The text is flexible and suitable for all readers, instilling crucial business skills needed to thrive in an office environment. With a clear, fluid chapter organization, Business Communication Today introduces, develops, and reviews major concepts to maximize understanding. MyLab™ Business Communication is an online homework, tutorial, and assessment program designed to work with this text to engage students and improve results. Within its structured environment, students practice what they learn, test their understanding, and pursue a personalized study plan that helps them better absorb course material and understand difficult concepts.